Access Solutions provides a range of commercial and residential disabled access equipment, uniquely designed for anyone experiencing mobility problems. Whether modifying an existing home or building a new one, we have a range of affordable and easy-to-use lifting solutions to ensure a comfortable lifestyle. Access and independence for the elderly and disabled is one of our priorities. We concentrate on sourcing the best products from Australia and overseas to ensure the lift that you purchase will best suit your needs and your budget. 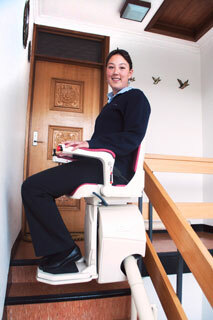 Stair lifts are whisper quiet and unobtrusive in the home. They are battery operated, requiring only a normal power point for the battery charger. This also minimises installation time and cost. Our stair lifts start and stop gently, with no sudden jolts. We have a range of models including stand-on, perch seat and fully-seated with a swivel seat. Access Solutions also provide a range of lifts for curved stairs. Our lifts can travel around the outside or inside of the staircase – the choice is yours. The swivel seat allows the passenger to turn away from the stairs at the top landing, allowing them to alight safely and securely. This hydraulic lift is fitted with braille buttons and audible indications advising direction of travel and levels reached, as well as dual controls for easy access by wheelchair users. Options available include a through-car with exit doors at both ends. It is ideal for schools and any public building.